If you have come here from the UKScrappers End of Summer Blog Hop, and even if you got here another way, I hope this little project will inspire you. You may have come from leanie’s blog here. Once you have commented on this post, hop on to MiniOwner’s blog, and don’t forget to pop on to the UKS comment thread, to be in with a chance of the random draw for the prize pack! Be sure to leave your UKS user name in your comment on all the blogs! If you lose your way, click the image above for the full list of Hop stations and all the links. I love using old things in new ways – re-cycle, up-cycle, re-purpose. Whatever you call it, it’s making something new from something old. When I recently re-did my DDs room, I found I had this old hanging light fixture that no longer had a home. As I looked at it, an idea formed. What the project will use is the metal ring fixture . I have lots and lots of photos. Some have been scrapped (or the better photos from the event have) and most of them are from back in the day when photos were printed from a film roll. Punch all the photos you need. 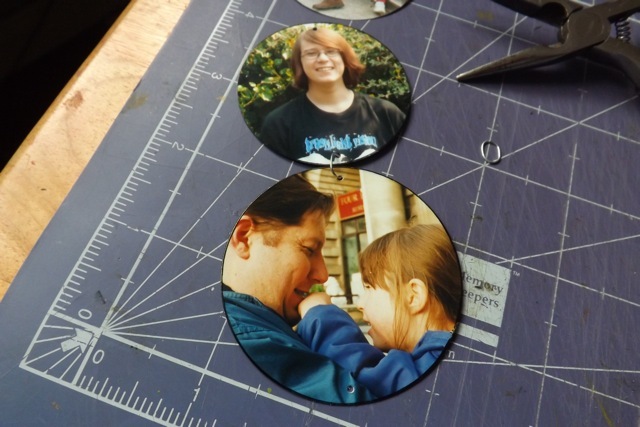 If you are using photos back-to-back, and using a variety of punch or die sizes, make sure you have matching pairs! 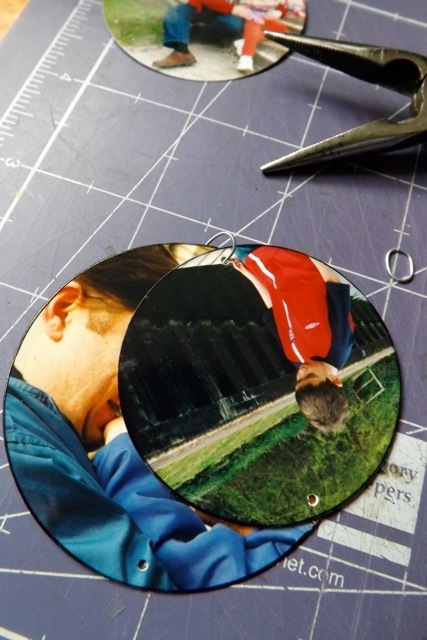 Punch a plain circle from scrap card. Using a ruler or gridded mat, divide the template at least in 1/2 (I did it in quarters but that isn’t really required) and punch your small holes. Make sure the holes are close enough to the edge that your jump rings will connect them so they still move freely, but not so close they could rip thru. Stick the pairs of photos back-to-back. I used both ATG tape as well as some photo-safe glue – both worked fine. 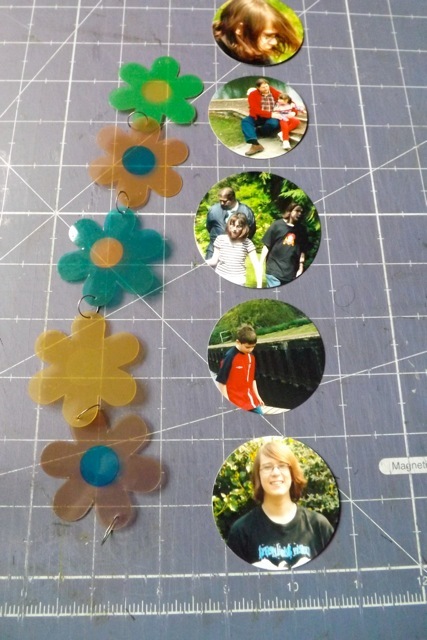 I edged all around the circles with a black permanent marker, to hide the white core of the photos. That is my preference, but you can skip it if you prefer. 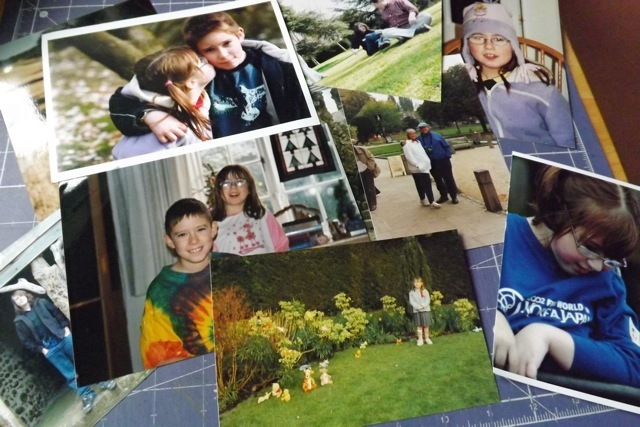 Lay out your strips of photo. Note the bottom one DOES NOT NEED a bottom hole punched in it. Use your template to punch the holes in the photo circles. 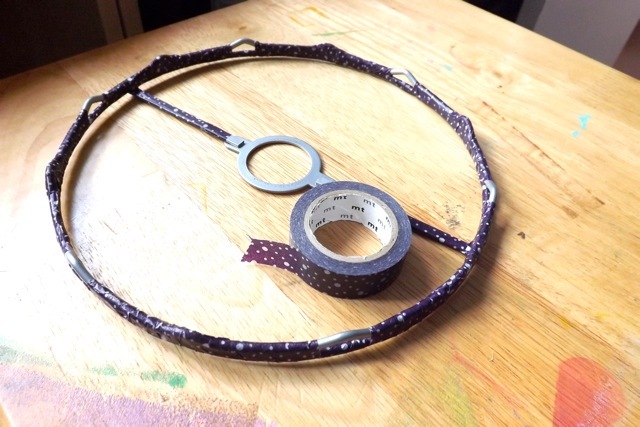 You can wrap Washi tape around the metal ring. You could also colour it with alcohol ink, or use a metal leafing pen, or simply leave it as is. I wrapped it with Washi tape, covering every other hanging notch, because I was using only 6 of the 12. 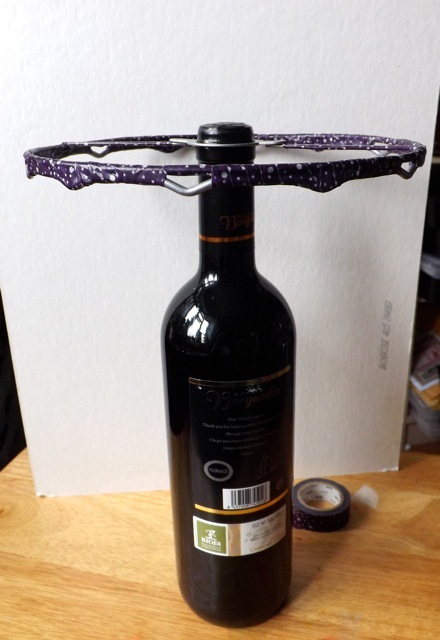 The easiest way to add the strands is to pop the hanging fixture over a spare wine bottle. then open the top jump rings and secure them in place. You can see where I added the plastic shapes. Totally optional. I had them so I used them, just one per strand. 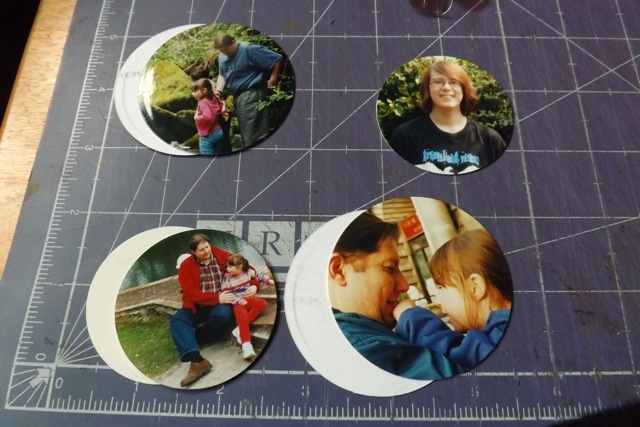 I think smaller plain card or patterned paper circles would have worked well too. Tricky to get a good photo. My fixture clearly states 40w bulb only. DO NOT be tempted to use a higher watt bulb. You don’t want the heat to cause your photos to burst into flames, although they are far enough away from the heat source that shouldn’t be a problem, better safe than sorry. I installed mine about 2 weeks ago, and have had no trouble with it. I would say this is NOT appropriate for a room where the overhead light is your primary light. My scrapping room has a wall of windows and lamps over the desk. The overhead light is just for a bit extra. The circles of photos do create some interesting play of light and shadow when it is dark outside, which I like, but which is not great for actual WORKING under. 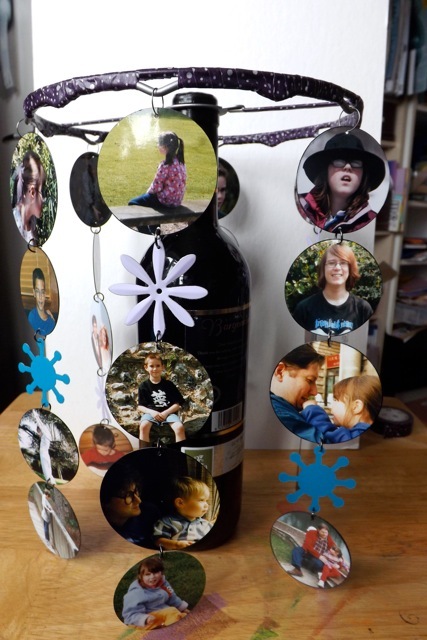 You could easily add a hanger to it and make something that is a bit more hanging mobile than light fixture. If so you could use any sort of ring, like the inner bit of an embroidery hoop. I am fairly sure you can buy the naked light hangers here, but not so sure about other countries. I never even saw a bayonet cap lightbulb till we moved to the UK! But I would NOT suggest using it over a crib, for example, as a baby mobile. So there you go! Hope you enjoyed it. Pop a comment on (mention your UKS user name) and then hop on to see the next project! 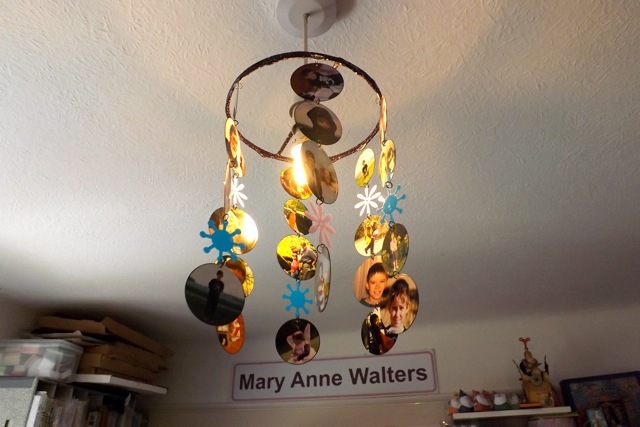 If you make one, do be sure to share it in the UKS gallery and/or on your blog so I can see it.